This post is dedicated specially to my Mom, who owns a corporate training company and for some reason can never find clothes to wear for her big teambuilding events. Clothes don't need to be especially fashionable to be stylish. All they need is a good cut and fit, and you're ready to go. If work involves a lot of running around and outdoor activities, you don't need to settle for a bad-fitting shirt just because it's the only thing available in a corporate clothing store. All you need to do is find a website that caters to work wear. A great example I've found is the Engelbert Strauss workwear section. This is just one example that I've found, so it's not necessary to purchase from here - I am just illustrating that work wear doesn't have to be ugly and out-of-date. Here are some of the examples that I found from the Engelbert Strauss website. My Mom, in particular, was on the lookout for clothes that look good and accentuate her figure, whilst still being appropriate for outdoor activities and team building training. As the head trainer, she also wants to project a more professional image. I found tops in dark colours to reflect the serious, corporate side of her needs, with great 'hourglass' cuts so her waist doesn't get lost in the fabric. She also doesn't want to break the bank with these clothes because she spends enough as it is on her normal corporate work wear, so I'm pretty glad I was shown this website - my Mom is a big fan of the polo tee, but for some reason, it is impossible to find a polo-t with a nice womanly cut unless you're willing to spend a bomb on Ralph Lauren. That's why I featured the polo-t in my selection - it's got a great cut and for a fraction of the price! I threw in the white pants because white pants always look so nice and crisp! I know, it's a little impractical if you're going to be running around outdoors all day, but fret not, that pair has a black equivalent, so it's all covered. 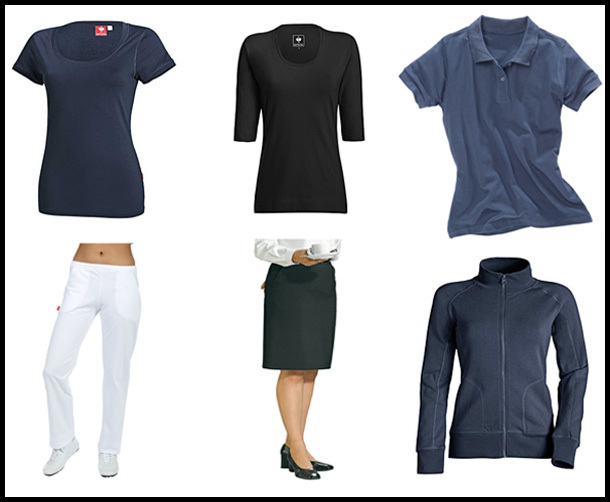 If you do want to check out Engelbert Strauss work wear, put ladies in the search box and browse away. I'm looking for more websites that feature good, affordable active wear that don't feature logos or colourful patterns and designs. Do you know of any?